STORY SYNOPSIS: With the aid of a U.S. Government multi-billion dollar technical device, Dr. Clinton Earnshaw and Jeff Adams are transferred back through the fourth dimension of time to Chicago shortly before that city's great fire in 1871. Their mission is to locate the antidote for an often fatal fever epidemic that has broken out in modern times. The film opens with the annual Mardi Gras festival in New Orleans where, amongst the celebrants, lurks a deadly virus spreading across the city. Soon it would spread across the globe...if not for the intervention of Dr. Clinton Earnshaw (Sam Groom), pathologist. He has recognized this as the deadly XB virus with a 40% mortality rate. Dr. (actually not a doctor according to his own testimony) Jeff Adams (Tom Hallick) is sent to aid Clint in his war against this disease, one so ancient it isn't even mentioned in medical texts anymore. The White House sends a Lear Jet for the duo that whisks them to a secret location where Earnshaw is presented with a perfect reproduction of a medical bag circa the 1870's with some added 1970's gadgets for good measure. Dr. Helen Sanders (Francine York, the lovely guest star of the second season Lost in Space episode "The Colonists") assumes Earnshaw has already been told by Adams that the two men will travel back in time to 1871 Chicago in an attempt to retrieve the cure from a Dr. Joshua P. Henderson but she only succeeds in confusing Clint more. The control room for the time traveling device is small and primitive, using leftover Lost in Space computers and Time Tunnel 'slant' panels and large tape decks. Earnshaw begins to believe in this group of scientists and their abilities and when he expresses his desire to alter time he is told by Dr. Amos Cummings (Booth Coleman, former simian star of the short-lived "Planet of the Apes" television series) that this is not allowed as the results could be disastrous. Clint is also told of the horrifying results of an earlier 'time jaunt.' Of the four travelers who went back only three returned alive-the other, twenty minutes late for his return, came back a decomposing corpse, killed by an arrow shot thirty thousand years ago! Eerie music by Morton Stevens accompanies Drs. 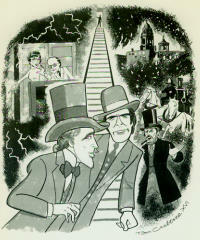 Earnshaw and Adams as they descend a set of metal steps enshrouded in the mists of time and in a flash wind up on an elevated railway station in 1871 Chicago. They travel along magnificent studio recreations of 19th century Chicago streets filled with hundreds of extras in period costumes, searching for Dr Henderson. They meet his niece Jane (Trish Henderson) who leads them to the Doctor (Richard Basehart), busy trying to help his patients, victims of the XB virus, here called Wood's Hole disease. After a fast introduction (in which the two travelers pretend to be government scientists) all three doctors pore through Henderson's medical records and can find nothing that could be a cure-but people are surviving thanks to Joshua. 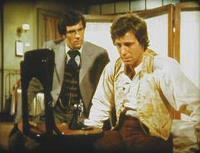 Adams, in need of a blood sample from one of these fortunate ones shadows Sharkey (Dort Clark), one of the first cured. In the scuffle Adams gets his blood sample but Sharkey mysteriously dies in front of a policeman, who gives chase to Adams. When Jeff does not return to the hospital Clint sets out to find him, only to collapse, weakened by the XB virus he is trying so hard to cure. Time is running out! We are given a ringside seat as the Chicago Fire starts, caused (as rumor has always stated) by Mrs. O'Leary's clumsy cow and a burning lantern. Henderson's treatment cures Earnshaw but still no one knows what the main ingredient is. The fire is spreading across Chicago and the two time travelers must discover the cure and escape to the present day as soon as possible! Jeff returns and through some deductive reasoning the doctors realize the elderberry wine Henderson administers to his patients contains the cure not the medicines. There's no wine left in the hospital so Earnshaw and Adams set out through the panic and smoke-filled streets to find some, which they eventually do. Shots of the sets burning are interspersed with black and white historical footage tinted red and orange as people flee the flaming city. Joshua and Jane are helping their patients into the wagons when Clinton tells Jeff of his plan to stay in 1871 with Jane. Of course he can't stay or time would be changed so the two travelers find their way back to the railway staircase from which they arrived and return to 1976 with a bottle of Dr. Henderson's wine, ready to save the present day from another epidemic. Earnshaw is recuperating from his bout with the disease in the hospital when Dr. Sanders and Dr. Cummings approach him with a new mission-cure the Bubonic Plague! As the telefilm ends the four scientists visit the graves of Dr. Henderson and Jane, who perished the night of the Chicago fire saving others one hundred and five years ago. Considering the awful television movies Irwin Allen was to inflict on the viewing public in the years to come this film isn't bad at all. Richard Basehart gives a outstanding performance as Henderson and the rest of the cast makes the best of script that is at best mediocre. One wonders if there was anything saved and used from Rod Serling's original script after Jackson Gillis got through with it. This film was a pilot for a series that never went anywhere, and probably rightfully so due to its lack of action in spots. Hard as everyone tries there are long explanatory scenes of dialogue that seem to drag hopelessly, which was unusual for an Irwin Allen production where action was usually the most important part. 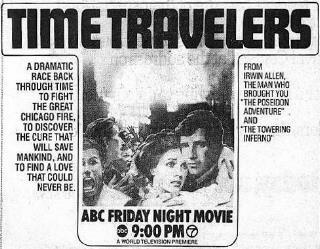 The best example of this was Allen's previous time travel series The Time Tunnel, much better than this pale effort.